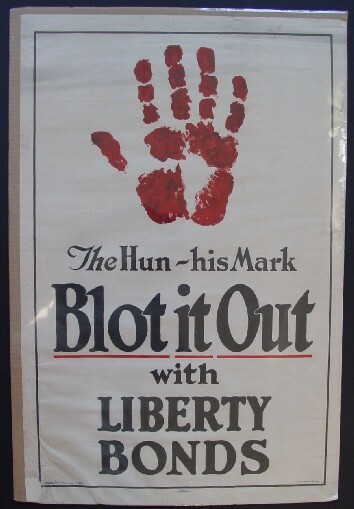 Comments: This poster has the classic image of a bloody German hand mark and the message that it can be blotted out if you buy Liberty Bonds. It is one of the earliest uses of Hun in posters to describe German soldiers. Condition: Shrink wrapped (see reflections on picture), unbacked, paper loss in bottom left corner, a few edge tears, otherwise good.